Did you know that you have to walk the entire length of a football field in order to burn off a single plain M&M chocolate candy? When I tell people that, they will just look at me with eyes wide and mouth open as if in total disbelief. It’s startling news to most people, most likely because it’s one of those bits of seemingly unimportant information that the average person doesn’t take the time to think about. That’s one reason why I like bringing it up. That simple fact allows people to place an image in their mind, a calorie and exercise equation of sorts. 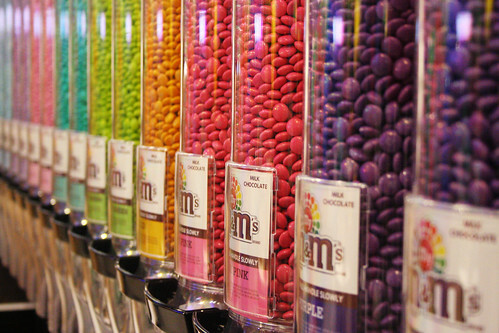 Envision eating just one M&M and immediately peering down to the far end of a 100-yard field of green knowing that it will require a measurable and predetermined amount of physical activity to burn off the calories from that single piece of candy. Would that change your mind about eating a piece of candy? Many people have told me that they like knowing these tidbits; they provide to be useful when focusing on better health. I have to agree, which is why I was so excited to hear about the campaign and public awareness posters that New York’s Mayor Michael Bloomberg introduced recently. It’s a pretty awesome campaign; the posters display the distance an individual person would have to walk in order to burn off the calories in a 20-ounce soda. This information may soon end up on food labels. It only makes sense that these types of conversion posters can help encourage people to make healthier food and beverage choices. In the campaign, they based the walking energy on a 160-pound adult walking at a slow rate, about 30 minutes per mile. Using those numbers, if this person consumed one “regular burger” containing approximately 250 calories, then they would have to walk 2.6 miles or 1 hour and 18 minutes. I think that really gives the average individual something to think about, don’t you? These calories to walking conversions are great, especially when you like the taste of salty snacks as much as I do. I know that if I eat one potato chip, I need to walk the length of 3 football fields in order to burn that one chip off! Consume ten potato chips and it will take one mile of walking to burn off the 100 calories, 20 chips and I’ll be walking two miles- at least 30 minutes- to burn off the chip calories (unhealthy calories at that.) My motto “One tastes the same as twenty” is always in my thoughts. When people are aware of the conversions it allows them to lead a healthier lifestyle because it puts things in perspective. Allowing individuals to understand how effective walking is at burning calories will not only bring more of a daily focus and awareness of exercise, but they’ll be more likely to incorporate walking into their day. I think that it’s time all Americans become more aware of the calorie content of the food and beverages that they are consuming along with the amount of exercise – walking – that it requires to burn those calories. The “out of sight, out of mind” mentality that I was so familiar with years ago is no longer an option in this country of ours. It’s time to face the facts no matter how startling the facts may be. Do you feel this campaign will change the eating habits of those who live in the New York area? Great article. Many people don’t realize that exercise does not burn calories as quickly as one might hope. Recent studies have also found that the food which we eat also affects how many calories we burn because our diets affect our metabolism. This Harvard article has a link to the original JAMA (Journal of the American Medical Association) article. Most people used to believe that weight loss was just a matter of counting calories. Thank you for sharing the Harvard article, I found it very informative! Learning WHICH food items we consume can also AFFECT THE METABOLISM and the number of calories each individual burns is great …very cool info! Thanks again! A football field is actually 120 yards. Just wanted to let you know. Thank you for that correction! I have had s stroke, can’t walk very far or fast, but trying to lose some weight by walking ! I don’t understand. This doesn’t just apply to unhealthy foods, does it? A strawberry is about 4 calories depending on the size. Couldn’t this be comparable to the m&m situation? Ways to give your metabolism a boost and burn more calories per day!